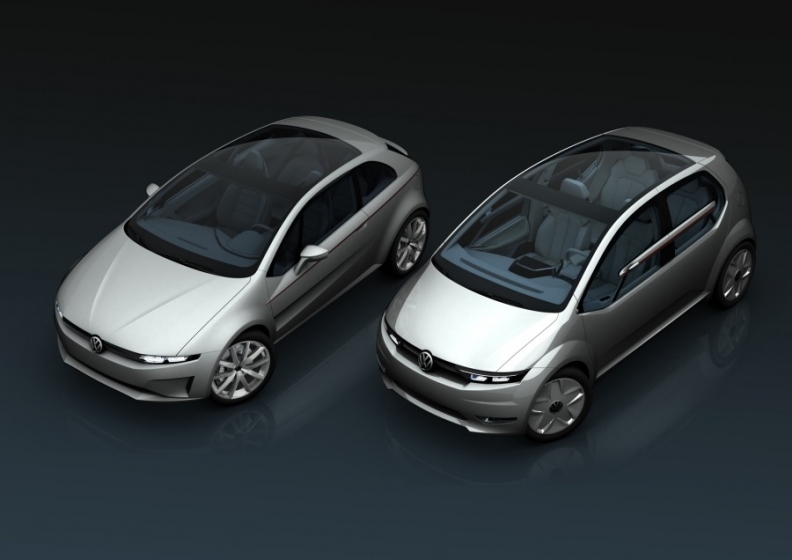 The Tex coupe concept (left) hints at the next VW Scirocco. The Go (right) is Italdesign Giugiaro's vision of the next Touran medium minivan. GENEVA -- Design legend Giorgetto Giugiaro has styled a hybrid coupe and an electric minivan for Volkswagen that preview possible greener models for Europe's biggest automaker. Giugiaro's Italdesign company unveiled the Tex plug-in hybrid coupe and the Go full-electric medium minivan at the Geneva auto show. Both vehicles are underpinned by VW's new MQB modular transverse platform that debuts next year on the new Audi A3 entry-premium car. "Italdesign is a creative center for fresh ideas and its integration in the group is a building block in our effort to take Volkswagen to the top of the automotive industry by 2018," VW Group CEO Martin Winterkorn said in a statement. Last spring, VW group bought a 90 percent stake in Italdesign to add more design and engineering capacity as the company strives to topple Toyota Motor Corp. as the world's No. 1 automaker. VW Group design chief Walter de' Silva said the concepts had a strategic importance for VW as "solutions for the urban mobility of tomorrow." Giorgetto Giugiaro said: "We conducted a research study imagining VWs of the future. The concepts are cars for the most part designed for the city with our highly personal interpretation." The Go is Giugiaro's vision of the next Touran medium minivan. Giugiaro said the concept continues his research for improved ergonomics and passenger room while keeping overall dimension as compact as possible. "Maximizing the interior space while minimizing the vehicle size had been a constant in my career," Giugiaro said. The Go has VW's Blue-e-motion electric drivetrain and has a 240km range. It is 3990mm long and further develops the Proton E-mas concept that Giugiaro unveiled at last year's Geneva show.The aim of the E-mas was to create a vehicle with easy access and an ideal seating configuration. At 4000mm, the Tex coupe is smaller than the 4260mm VW Scirocco but offers the same roominess. The Tex is fitted with VW's plug-in hybrid system called Twin Drive. The system couples a 1.4-liter turbocharged engine with an electric motor. It has a 35km range powered only by electricity.